According to a new book by Huntsville native John Warren Smith, there was a lot of "sin" in the old East Texas town of Cincinnati. And many from the Cincinnati area did not like nearby Huntsville, including its greatest hero and its establishment family. Smith, who earned his first degree from Sam Houston State and spent most of his 36 years of teaching literature at Texas Christian University, has completed a book, which he calls a "nonfiction novel," about his family. 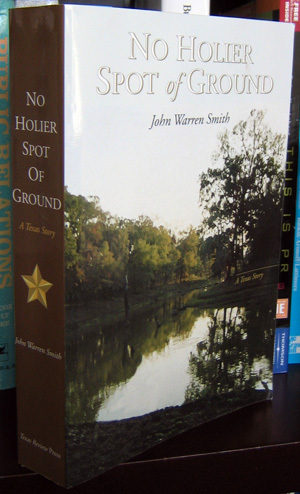 "No Holier Spot of Ground: A Texas Story" details the rise and fall of Smith family plantations along the Trinity River north and east of Huntsville, near what was once the community of Cincinnati (local pronunciation "sin-suh-nattuh"). At times the town had an estimated population between 200 and 600, but that declined after a yellow fever outbreak in 1853. By 1882 there were only 35 residents, and by 1892 the post office was closed. Smith aims for "an authentic feel of life along the Trinity River from 1835 to 1869," according to the cover blurb. Huntsville life is also prominent because of the proximity and political connections between the two communities, and the fact that Huntsville beat out Cincinnati in the contest to become the county seat of Walker County. In the foreword, Smith writes, "I found shocking information: fornication with slaves, adultery, scandalous divorce with alimony (almost unheard of in Texas in the 1860s) imposed by a jury in Huntsville, a hidden lunatic, even murder." The Texas Review Press and Sam Houston Memorial Museum are sponsoring a book selling and signing beginning at 6:30 p.m. Jan. 27 in the museum's Walker Education Center. Smith will speak at 7:45 p.m. on "Problems of Converting Family History to Story." The book is a thick one--656 pages in paper cover. It will be available at the Jan. 27 event and from the Texas A & M University Press Consortium, 800.826.8911, for $21.95.